Government spending about RM9bil on infrastructure projects, of which RM4.7bil on road and bridge projects, RM2.6bil on water supply and sewerage services, RM899mil for rail facilities, RM820mil for ports and sea services coupled with RM276mil for airport projects (Upgrading of Penang or Sibu airports?). In addition, another RM2.3bil will be allocated for construction and upgrading of infrastructure in rural areas, of which RM857mil will be used to construct 510km of rural roads and 316km of village roads such as Kapit, Lawas and Kimunjan in Sarawak and Kinabatangan, Kota Belud and Keningau in Sabah. Road and bridge projects - WCT, Gamuda, Mudajaya, IJM, Muhibbah Engineering etc. A tax of 5% on gains from disposal of property while the existing tax exemption is maintained only for gifts between parents and child, husband and wife, grandparent & grandchild. This exemption will also be given on disposal of residential property once in a lifetime. This will take effect from 1 Jan 2010. Nonetheless, the Government is launching a scheme to allow EPF contributors to utilize current & future savings in Accounts 2 for purchase of one property at a time. However, the calculation of future savings remains vague. A counterproductive move to the property sector which is a discouragement to property investors from local and abroad. Whether the 5% tax is applied to gains from all kinds of disposal remains vague. What happen if I bought a house like 20 years ago which cost me RM50K and now am selling it at RM200K? Then I have to pay as much as RM7.5K in taxes which is a lot. There are even some reports that said that this 5% tax on gains only applies to disposal of properties within 5 years and beyond while gains from disposal within 2, 3 & 4 years might actually be taxed as high as 30%, 20% & 15% respectively (Not sure about this though). Could be a dampener to property stocks prices next week. Nevertheless, the new EPF scheme to allow usage of Account 2 to purchase residential properties will provide some respite, hopefully. Tax relief on broadband subscription fee up to RM500 a year from 2010 to 2012 is proposed. Government will also expedite implementation of High Speed Broadband at a total costs of RM11.3bil, of which RM2.4bil is from the Government while the rest of RM8.9bil will be from Telekom Malaysia. Broadband services with 10Mbps will be available in KL & Selangor by end-March 2010. Tax relief is positive for telcos like Digi, Axiata, Maxis (to be listed soon) and Green Packet (Packet One is the subsidiary which offers Wimax). TM might attract interest on HSBB. Liberalize common sharing arrangements between stockbrokers and remisiers in 2 stages to encourage retail participation. The 1st stage is to allow sharing at min rate of 40% for remisiers and fully liberalized by Jan 2011. Allow 100% foreign equity participation in corporate finance and financial planning companies as compared to current requirement of 30% local stake. The liberalization will allow greater competition among stockbrokers in rewarding remisiers who perform well and at the same time encourage remisiers to garner more interest in the stock market from the investors. The allowance of 100% foreign equity participation in corporate finance is a welcome relief which will encourage greater competitiveness among the local corporate finance providers and more corporate exercises will be seen in the market, good for the capital market. A slogan that has been preached for 10 years but doesn't seem to go anywhere. Very ambitious. This means 7.2% growth p.a. Adding 2% p.a. population growth, 9.2% growth p.a. in income per capita for the next 10 years!! We are aiming to beat China izzit?? How are we going to do that?? No answers. How to encourage? Dunno. Companies are not charity organizations. There is no obligation or responsibility at all for local companies abroad to remit their profits & reinvest into Malaysia. If they could find greener pastures overseas, why come back here? Government must take action first. Don't expect companies or talents to automatically come back to contribute to Malaysia. Just by talking to companies' management here, they find it so difficult to employ good people to work with. Lazy, incompetent and the worst thing is that they can't even speak a proper sentence in English. Our very little attraction of bringing in foreign investment which is our proficiency in English has even been destroyed by our very own system here. "Demolish PPSMI", we often hear. Recent Government's flip flop decision to revert back to BM in teaching Maths and Science is not helping either. First thing that comes to my mind, broadband. Our broadband penetration is just 25%, broadband service ranking is No.48 out of 66 countries. Broadband fees are exorbitant, a lease line 6Mbps from TM costs RM250K per year, which is way beyond many SMEs' budget. If we don't have the IT infrastructure to enable businesses to run, how to attract investors? Well, at least HSBB by TM is rolling out in 1Q2010, a good move in the right direction. Hopefully the timeline will be done as announced. Coupled with other reasons like escalating crime rates, corruption, weakening workforce, we are actually seeing a decreasing trend in net FDI as shown below. Nothing to say. A look at our universities' ranking will show how pathetic our education system and human capital are. As long as universities are not fully liberalized, not free to think, not free to discuss politics or join political parties, have to kowtow to the Government in appointment of management & funds or anything, not based on merits, not given fair chance of education among all races, then kiss goodbye to whatever intentions to strengthen higher education. Poor universities => incompetent graduates => absorbed into civil service => ballooning civil service => high operating expenditure => lower GDP growth => stagnant salaries => strain on working population. We have a massive 1.2 mil civil servants against 10 mil working population. More money is poured out to sustain Government operation rather than being spent on development. Growth in operating expenditure is increasing at a greater magnitude than development expenditure for the past few years. Nonetheless, the budget is starting a new direction for the management of its expenditure. 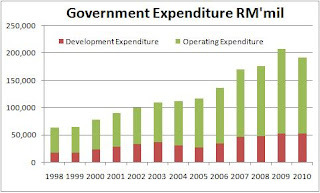 The Government intends to cut operating expenditure from RM154.2bil to RM138.3bil to reduce inefficiencies in Government operations while development expenditure remains almost the same. Ok. Fair enough. Hopefully, the Government could continue the trend in cutting operating expenditure and increasing development expenditure at the same time. The Government also intends to implement measures to attract talents to Malaysia. I guess the main motivator will be the salaries here. Since Malaysian salaries are so low, it will be an uphill task to attract Malaysian and foreign talents to come to Malaysia. The continuous influx of foreign labor (3.5 million out of 27.5 million population = 12.7%!!!) will continue to impede the economy from moving higher in the value chain and putting a cap on Malaysian salaries. Malaysian companies won't be willing to move up when cheap foreign labor is so readily available. Anyway, Malaysia has always been famous for talk and less action. Word without action is dead. Hopefully, Najib could prove otherwise. Give him the benefit of doubt as he pleaded.